T+L Culinary Journeys: It’s the stuff of vacation legend: that relaxed, authentic shack serving fantastic local seafood. Maggie Shipstead accompanies the irrepressible Spanish chef José Andrés to his top spot, McKenzie’s Fresh Conch in the Bahamas. Chef José Andrés behind the bar at McKenzie's Fresh Conch, in the Bahamas. As we left the Atlantis Bahamas resort and turned toward Nassau, a siren whooped and lights flashed. Chef José Andrés turned to peer out, but the cop sped past. “I bet he’s going to McKenzie’s,” Andrés said. He shook his fist. “You better not get there before me!” We were on our way to his favorite lunch venue, McKenzie’s Fresh Conch, in Potter’s Cay, a strip of shacks hawking cold beer and the national specialty: conch. Andrés has been in the Bahamas a lot lately, working on Fish by José Andrés at Atlantis — sister to his Washington, D.C., restaurant of the same name. His mission? To elevate local cuisine and spotlight sustainability. Lionfish, an invasive species wrecking Bahamian reefs, is a star entrée. 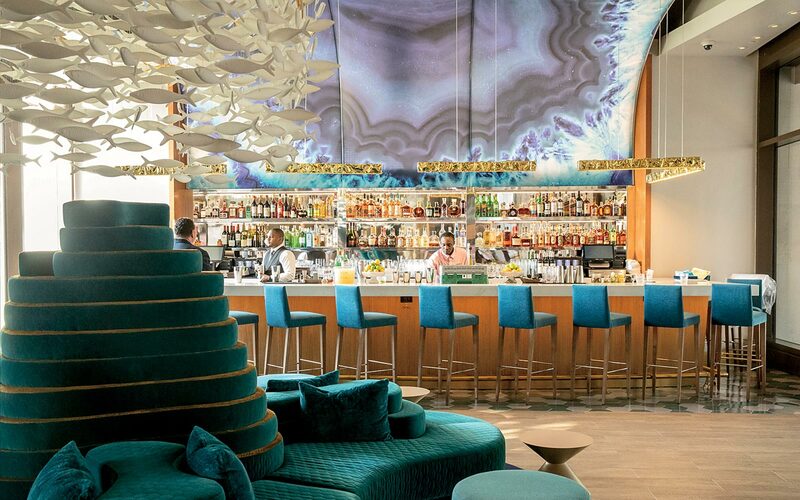 The new outpost of Fish by José Andrés, at Atlantis Paradise Island Bahamas resort. Andrés squeezed lemons and limes, then added Sprite and grenadine. “McKenzie on the Rocks!” he declared, handing me a plastic cup. “If it’s no good, don’t blame me.” It was good. Best conch salad and conch fritters... every time I’m in the Bahamas I visit McKenzie’s! McKenzie, still in sunglasses, his long dreadlocks gathered on his back, donned a green apron and set to work making conch salad. He chopped onions, tomatoes, bell peppers, and scotch bonnets, then diced five of the white, fist-size mollusks and mixed everything together with citrus juice and salt. “Nobody does it like him,” Andrés said in a confidential tone. A whole fried red snapper appeared, sharing a foam plate with a pile of fried plantains. “Boom!” Andrés said. He topped a plantain with a piece of fish, squeezed lime over it, and popped it in my mouth. Andrés’s instinct to feed people is a force to be reckoned with. Once a cook in the Spanish navy, he now owns a rapidly proliferating network of restaurants — Fish at Atlantis is his 31st. But to him, the power of food goes far beyond its business potential. Since Hurricane Maria hit Puerto Rico last year, Andrés and his nonprofit World Central Kitchen have served more than 3.6 million meals on the island. We’d been told there were no conch fritters, but Andrés got on his knees in the kitchen and begged until one of the bemused cooks shooed him out, saying she’d try. Crab and rice appeared and, then, miraculously, a plate of the longed-for fritters with a tub of pink sauce. Andrés scooped up a forkful of conch salad. I opened my mouth. The bite was impossibly fresh, with a little heat and a little tang. It tasted of the sea and of sunshine on a vegetable patch. Boom. Where to Go: Stall 1, Potter’s Cay Dock, Nassau; 1-242-425-4934; entrées $12–$26. Fish by José Andrés. A new addition to the Atlantis resort that serves Bahamian cuisine with a sophisticated twist. atlantis bahamas.com; entrées $24–$58. McKenzie’s Fresh Conch. The Potter’s Cay classic has a new outpost in Atlantis’s Marina Village. atlantis bahamas.com; conch salad $14–$16. Twin Brothers. Near Arawak Cay, Nassau, this restaurant is a solid option for seafood, burgers, and, yes, conch. twin​brothersbahamas.com; entrées $18–$52.